This was potato free but nevertheless quite delicious as I didn’t skimp on salt, pepper and garlic! 1 large onion or leek. 1.5 cups of cooked kidney beans (about a tin). 15-20 small sweet cherry tomatoes. Saute the chopped onion or leek and chopped clove of garlic in some butter then half way through cooking at the cherry tomatoes until they start to brown and turn soft and break up. Add salt, pepper and dried mixed herbs. Set aside. 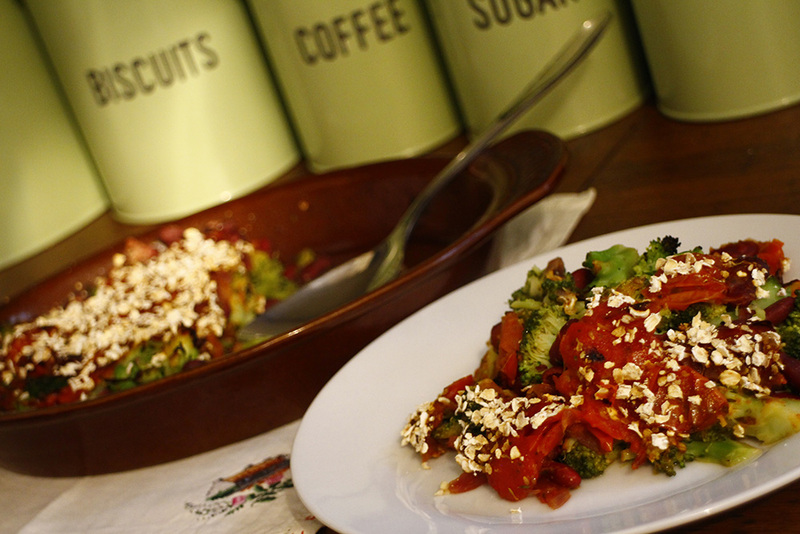 Chop/break up the broccoli in to small floret sizes. Add to hot water and boil for 5 mins until half cooked. 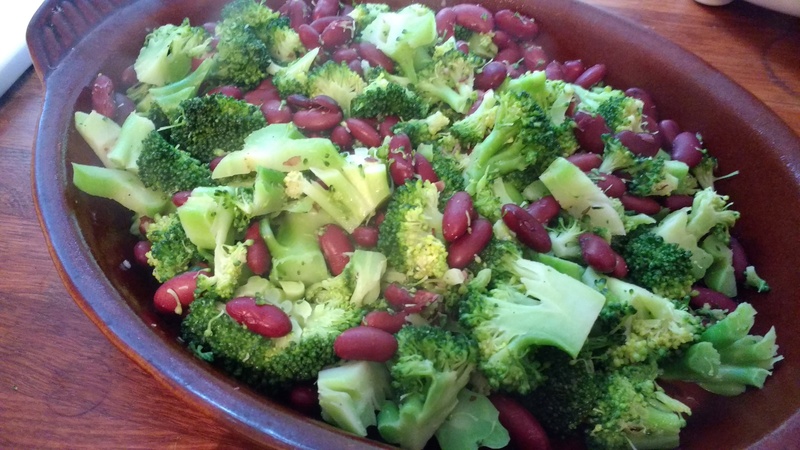 Drain cooked kidney beans and add to broccoli and hot water for a minute or two. Drain. Add butter to large pan and saute chopped clove of garlic and then stir in the drained broccoli and kidney beans and cook for a minute. Add all to a shallow baking dish. Season with salt and pepper. Spread the onion and tomato mixture over the top. Sprinkle top with some rolled oats. 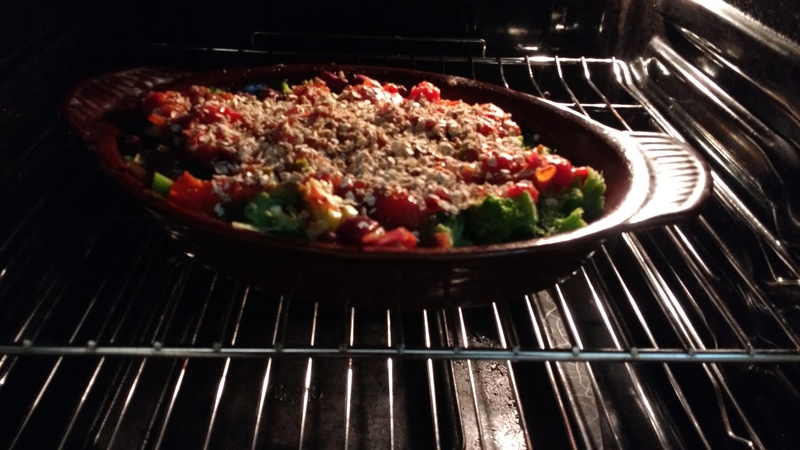 Bake in centre of oven for 20-30 minutes until veggies start to brown at 220C. Makes two generous portions and could be served with some bread or a pie! It’s quite dry so serve with gravy or a white sauce. 22 lb on in 8 weeks and it’s all to do with convenience food. Let me tell you I am not happy with this. It’s all my fault. 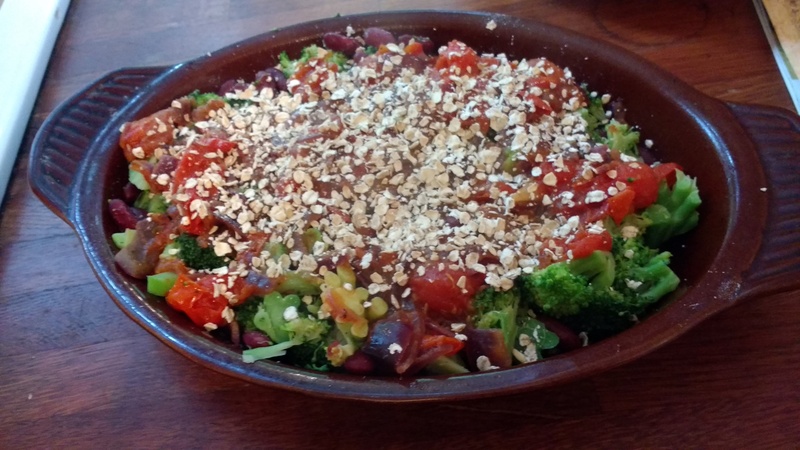 It’s made me realize that it’s so very easy to go back to bad eating habits. But I’m using this weight gain as confirmation of what I’ve always known and that is as soon as you start eating lots of food prepared in a factory using ingredients that have been modified, it’s going to make you sick, it’s going to make you fat, especially if you exercise little or have problems controlling quantity. Today I’ve had a good start. Lots of salad and some homemade wholemeal bread and about to make an onion, tomato and broccoli bake for lunch with leftovers for dinner. I’m already peeing every 30 minutes and that is a great sign as the toxins begin to flush out. I’ve also signed up for a large organic veg box scheme (first delivery next Wednesday) and that I feel is worth investing in, UK and local organic veggies, smaller independent producers and pesticide free vegetables. I saw a competition on Gumtree so submitted my dresser just for the hell of it! 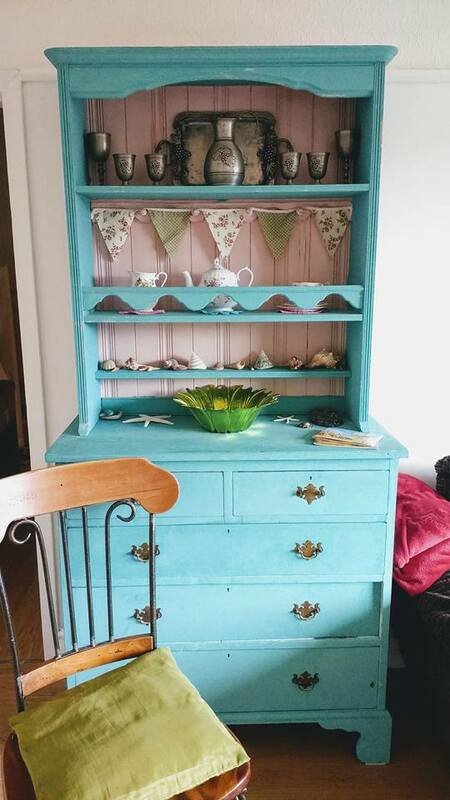 I’ve always wanted a painted dresser but like most of us, just don’t have a spare few hundred pounds to just go and buy one when there are priorities like food, electric and bills! To cut a long story short last year I found a set of shelves (on Gumtree) that had been used as a bookcase in the child’s bedroom and bought those and shortly after I also bought a very beaten up chest of drawers. 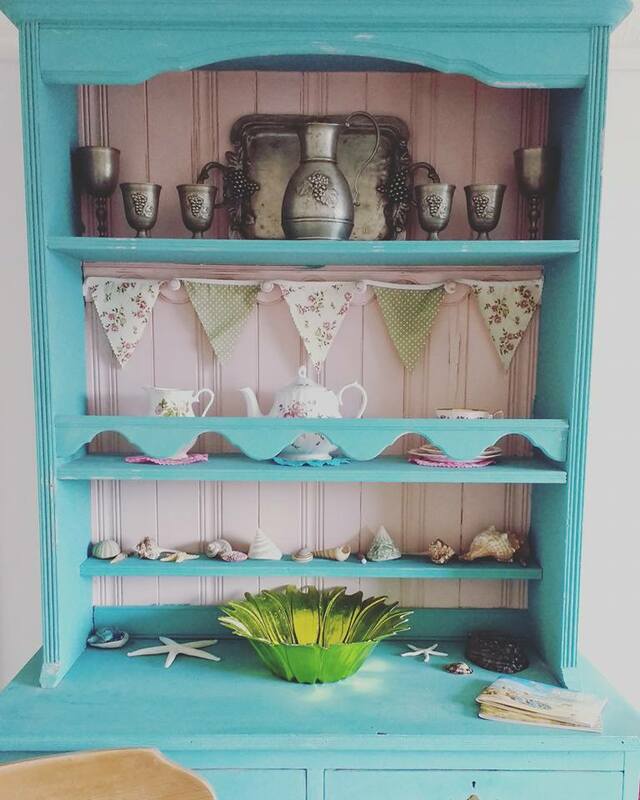 They fit perfectly together and looked like a dresser so I also bought a small pot of chalk paint and just went for it! In total the whole project cost me less than £50 and I now have something unique with a story to tell. I’d never part with it! Would love to hear if anyone has also upcycled something! 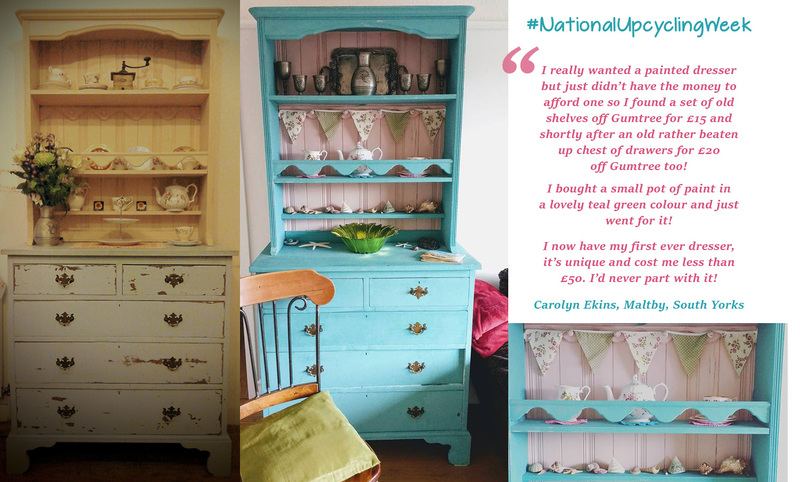 It’s great to think we are making use of old objects that people may throw away and are giving them a new lease of life! We finally made it up North to South Yorkshire! Very happy but really shattered! There are lots of boxes to unpack, beds to be assembled, decorating to be thought out, curtain poles & curtains to be purchased, handles to mend and not least a few more car loads of belongings from our old house in Nottingham to bring up (and a few days scrubbing our old home before we hand it back). BUT the main thing is we are IN! Already, despite the worry now of being broke with all the expense of moving and paying double rent for a while, I can feel the fog lifting and feel much happier. I’m sitting here at a desk in my bedroom, typing this, over looking some allotments and hills and appreciating how I can see some grass and trees and that there is a public footpath up that hill and for miles and miles through fields of wheat and this is making me smile. Today I’ve baked a granary loaf with my new secondhand bread making machine I purchased the other day from someone on my street, unpacked several more boxes and given myself a computer desk with a view. Am so excited about finally having my own private desk with a view and intend to spend a lot of time here! Well the lawn beckons! I’m not sure whether I’ll have time to create a victory garden this year but I do have some string beans in (from a friend at work) so at least it’s a start! 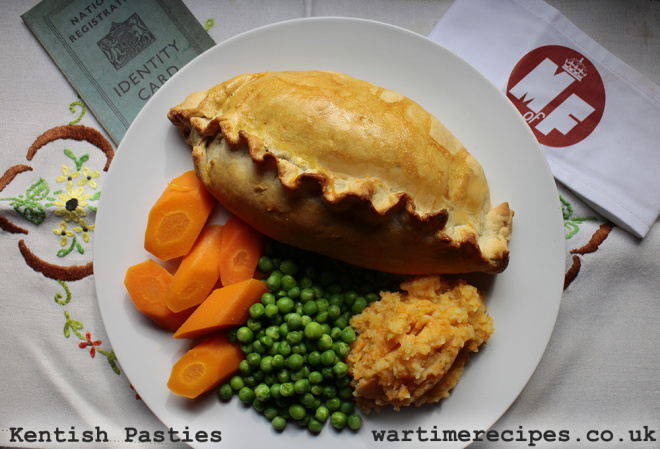 Reblogging one of my favourite wartime pastie recipes. If I had time to bake and could find my cooking utensils (packed away because of the move next weekend) I would definitely cook these today and serve them cooled with a nice crisp salad and a pint of beer! 6 days until we move! In the WW2 recipe book ‘Good Eating’ published in the 1940s by the ‘Daily Telegraph’ and which included wartime recipes tried and tested by readers, I came across a recipe for ‘Kentish Pasties’. This particular recipe, according to the reader, was for a popular pasty distributed by mobile canteens and pie stations at Sevenoaks Rural District during the war. Using the ingredients in the recipe, I was able to make three huge pasties which could easily be cut in two, one half for your dinner (served with veggies and gravy) and one half for your lunch the next day (although I am sure if you were working on the land a whole pasty for lunch would be appreciated) I also added two teaspoons of Marmite and one chopped leek which added to the flavour as it was a little bland without. Overall I found this very filling and tasty! June Update – At the Houses of Parliament and nearly time to move! If there is one thing I am desperate for, it’s time. At the moment I am staying 4 or 5 nights a week on an airbed (with no furniture and no WI-FI or TV) in our new rental house (just 2 miles from work). It is convenient, saves time and money and I’m so knackered that I’m in bed most nights for 8 pm! Every weekend is spent back in Nottingham frantically packing, cleaning and painting in preparation for our forthcoming house move. By June 30th all should be handed back over and our new home should have furniture in it although my dining table will have to live under my bed (once I’ve taken the legs off of course) as there is simply not enough room for it. I’m hoping by the end of July everything will have settled down into some sort of normality and routine so I can once again focus on eating healthier (10 lbs on since the Marathon!) and start re-creating more wartime recipes. I’m seriously missing my stepping back in time (culinary of course) – it feels like part of who I am has gone missing. In addition to getting back on track with recipes and weight loss I have exams to study for in December (Certificate in HR – Level 3) and an awful lot of catching up to do regarding that too! I’m still working on building a complete vintage recipe/event/shopping phone app (which will include every single wartime recipe I have recreated with photos) as well as a directory of all vintage tearooms in the UK, and vintage clothing shops, vintage events, vintage everything really….. it’s a huge undertaking and very time consuming but what I’ve learned in life is you have to put the effort in and be jolly patient and passionate about something and willing to persevere for anything to be remotely successful. One exciting thing happened recently, I got to go to the Houses of Parliament in Westminster, London on Election night for a lovely Summer Dinner! It was through work ( www.pmsdiecasting.co.uk ) and had a wonderful time! The buildings were absolutely stunning! What an experience! Take care all, can’t wait to be back online properly and have time to take care of the blog again.